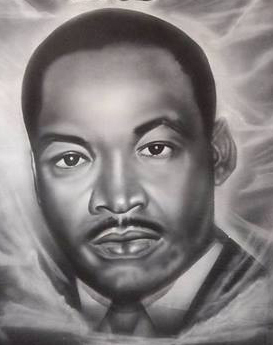 Home / Music / Martin Luther King Jr.
Arius did an Amazing job on airbrushing designing my daughters skates for her Birthday surprise, he is a Very talented and professional guy! Will definitely be using his services again. He did a great job on the sign for my business! Definitely highly recommend! Arius is one of a kind. A true professional. I have thrown 5 projects one on top of another and he has excelled in them all. His work is impeccable. He is a true class act. Thank you for being you and keep striving. 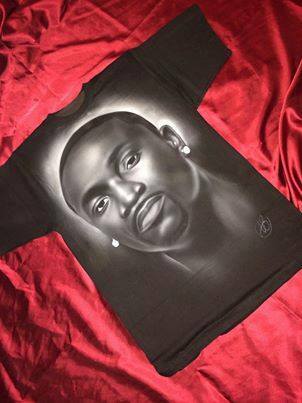 Wow, we just received one of the most amazing works of art from Air Brush Xspress! Airus did an incredible job capturing the exact likeness of our son. This picture will be proudly displayed as a part of our sons legacy. Thank you Airus for using your gift to bless so many people. Arius is a very talented artist. He took something that is most dear to me and brought it to life having never worked on that type of project before. This man has "SKILLZ"
A responsible person. Reliable and trustworthy and he gives A + service you can trust. True attention to detail shows in over 15yrs of craft perfection. Aruis Bell is diverse in many different techniques and art abilities. Try this company and you won't be disappointed. Arius, Mike, and Shawn did a phenomenal job at an event we had at Emory University. We supplied them with cloth drawstring bags, and they were able to beautifully customize them with students' names quickly and efficiently. They were also incredibly easy and pleasant to work with--very polite and cheerful. I would highly recommend their business to anyone looking for airbrushing. This artist is one of the best i have used. You need to see his motorcycle helments. Great job on my rain guard for my car!!!!! They came out awesome!!! Arius recreated an image of missy on a denim jacket for me. The end result came out perfect! I would highly recommend his services if you’re looking for quality, quick and professional work. Arius Bell is a very Gifted and Talented Artists!! He has great customer service skill and he is very professional!! I would recommend this business to everyone that I meet that is looking for a Great Artists! !